Screening the Past > Glimpses of Freedom: Independent Cinema in Southeast Asia. 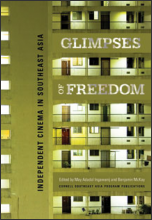 Glimpses of Freedom: Independent Cinema in Southeast Asia. To what extent have independent and alternative film movements emerged in Southeast Asia? What forms do they take, and what roles do alternative, non-mainstream films currently play in countries such as Malaysia, the Philippines, Thailand, Singapore, Indonesia, and even East Timor? Moreover, how does one get to see such films? Glimpses of Freedom: Independent Cinema in Southeast Asia provides some cogent answers to these questions. Since 2005 an annual ‘South East Asian Cinemas’ Conference has been held in the region, its venue rotating between a number of Southeast Asian capitals: Singapore, Bangkok, Kuala Lumpur, Jakarta, Manila, Ho Chi Minh City. Academics, postgraduate students, filmmakers and archivists from the region and around the world regularly attend this conference, and an increasing body of work has emerged. This excellent book, addressing in many dimensions a new and largely unknown area of filmmaking, originated in networking that occurred at the 2006 Conference held in Kuala Lumpur. The first section of the book, entitled ‘Action’, addresses in a variety of ways some diverse initiatives that have emerged, what has prompted or facilitated them and what obstacles they faced. There are interviews with the founder of Q!FF (Queer Film Festival in Jakarta), John Badalu, and with a quiet, self-effacing, but determined figure, a young film editor in Singapore, Martyn See, who has made documentaries about political figures targeted by the Singapore government. In 2005 See made Singapore Rebel, a short documentary about Dr Chee Soon Juan, a key activist with the Singapore Democratic Party who has tested rules for holding meetings in Singapore and been successfully sued by Lee Kuan Yew for defamation. Subsequently See made Zahari’s Seventeen Years (2006) about a left wing journalist arrested in 1963 and imprisoned for seventeen years, who is now living in Malaysia. These films are banned in Singapore but readily available on the Internet. An informative article by Hassan Muthalib begins by outlining the role of Indians and Malaysian-Indians in developing the Malay film industry, and then goes on to give an account of films made in Malaysia by fourth generation Malaysian-Indians associated with the Little Cinema movement from 2000 on, representing the lives and characteristic experience of mainly ethnically Tamil Malaysian people, often regarded by the country’s Malay elite as second-class citizens. Although the Little Cinema movement is one product of Malaysian Prime Minister Mahathir’s prioritisation of digital technology, these socially conscious films of the Little Cinema movement, and some mainstream films also made by Malaysian-Indians were not (until very recently) eligible for the 25% entertainment tax rebate because their dialogue is not 70% in the Malay language. John Torres, an Indie filmmaker in the Philippines, reports on his own (unsuccessful) attempt to put his films into distribution via the film piracy networks so rampant in Manila, concluding that it was very difficult to penetrate such organisations. There is a survey of the gradual emergence of the Thai short film, and of longer independent films, particularly since the mid-1990s, by the director of the Thai Short Film and Video Festival, critic and archivist, Chalida Uabumrungjit. This wide ranging and theoretically diverse book also contains numerous reflections on what the term ‘independent’ can mean in the different contexts of filmmaking and film cultural work in each of the countries under discussion. One area lacking in the book is any discussion of films by Indonesian independent filmmakers, some of whom have played a role in re-examining Indonesia’s past under Suharto (for example Lexy Rambadeta) and who have also directly addressed problems in militarily suppressed and exploited regions of Indonesia (notably Ario Danusiri who has made important films in both Aceh and West Papua).